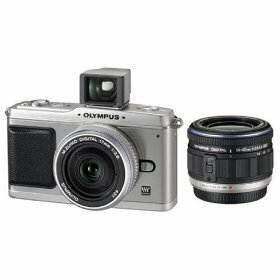 As a 'world-first' you wouldn't expect the Olympus EP-1 to come cheap and it doesn't disapoint. Styled with the Olympus look of old it claims to be the first mini-camera with SLR quality. Its features include: ISO 6400, allowing you to capture sharp low-light images without a tripod; a dust reduction system between the shutter and sensor that uses high frequency vibrations to shake off settled dust; High-definition video recording at 30fpm with HDMI output and even a touching-up option that allows the removal of facial blemishes and wrinkles that HD reveal so your subject can look their fake best! £734.98 from Amazon.